The Indian Institute of Gems & Jewellery Mumbai conducted its 12th Annual Convocation on December 1, 2018 at the Bharat Diamond Bourse Convention Hall. 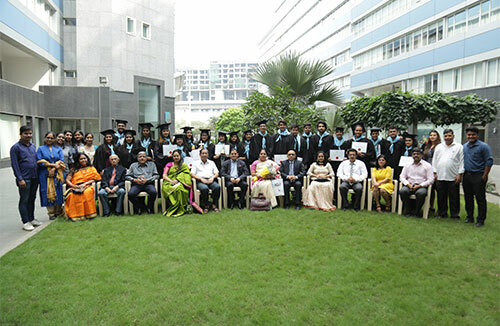 Chief Guest Dilip Kumar Lakhi, Chairman - Lakhi Group and Guest of Honour Dr. M. M. Hundekar, Principal - School of Fashion Technology Pune felicitated the students of the institute’s graduating batch and gave away the graduation certificates to the successful studen. The IIGJ Chairman’s Trophy 2018 was awarded to Sayali Chalke, while Vidhi Dedhia was the first runner up and Aashi Shah was the second runner up. All three were recognised for their consistent performance and excellence during their three-year degree programme. The institute also felicitated Dr. Saumya Badgaya, General Manager, Gold Star Jewellery Pvt Ltd for extending endless support and encouragement to students in placement and internship. The Chief Guest congratulated all the students and spoke about the growing competition within the industry and the importance of design. Head of the Institute Sanjoy Ghosh said a few words to inspire the students and proposed the Vote of Thanks.